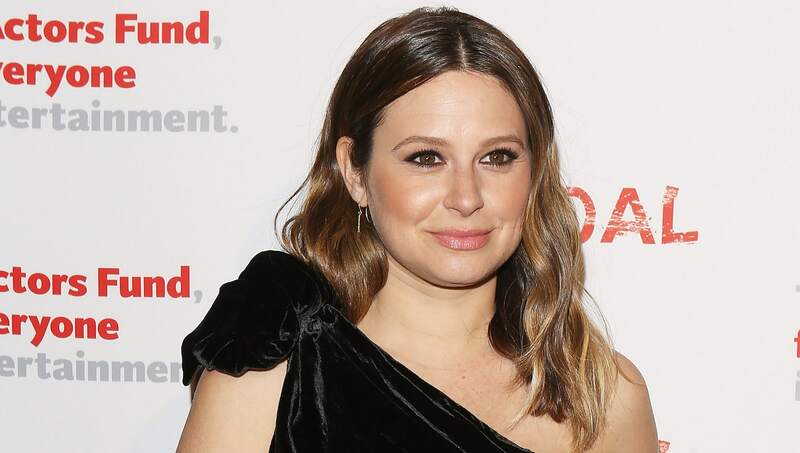 Katie Lowes — star of Scandal as well as the host of the new mama-centered Shondaland podcast Katie's Crib — recently opened up about the pregnancy loss she suffered before the birth of her son, Albee. Lowes (who plays Quinn on Scandal) tweeted about the miscarriage episode of the podcast, sharing a brief video with her Twitter followers. Lowes revealed on her podcast that when she first heard the devastating news that there was no heartbeat, her instinct was to push through and just keep moving. “The initial feeling, when I found out there was no heartbeat from the doctor in a routine checkup, was like, ‘OK, let’s Olivia Pope the situation. Let’s fix it,’” Lowes said. ”‘Let’s make the schedule. Let’s get to the hospital. Let’s get the [dilation and curettage]. When can I start trying again?’” she recalled. "I was about 11-and-a-half weeks. I was a couple days away from telling everybody that I was pregnant." When Lowes became pregnant again (with son Albee, now 7 months), she hesitated to share the news. "I waited way longer than 12 weeks to tell anyone because I kind of had PTSD about the miscarriage for sure," Lowes admitted. We're so happy for Katie and Adam and Albee. And we're grateful to Katie for talking so poignantly and openly about pregnancy loss on her podcast, helping others who have suffered miscarriages to feel less alone.